The aim of this 3-day (15 hours) advanced training is to provide an in-depth orientation to the key themes and key assessment and treatment facets of the Collaborative & Proactive Solutions (CPS) model. You will receive in-depth training and review of the model through direct lecture-style teaching by Dr Greene including interactive participation, case studies, video examples and a live demonstration. There will also be question and answer opportunities. 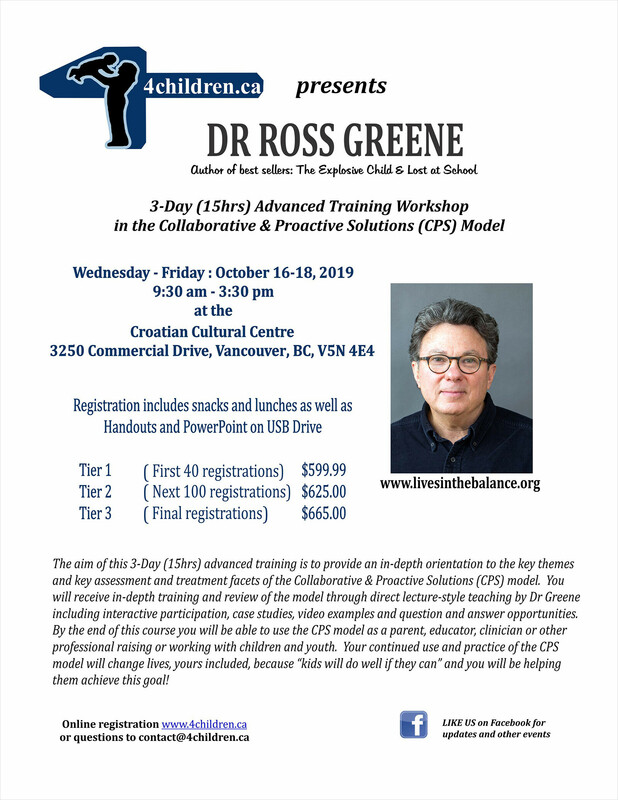 By the end of this course you will be able to use the CPS model as a parent, educator, clinician or other professional raising or working with children and youth. Your continued use and practice of the CPS model will change lives, yours included, because “kids will do well if they can” and you will be helping them achieve this goal! This entry was posted on October 16, 2019 by Events Manager.